What is a Klondike Derby? A Klondike derby is an annual event held during the winter months and is based on the heritage of the Klondike Gold Rush. Patrols will pull their Klondike sleds throughout the designated staging areas. Along the way, they will be tested on Scouting skills at various stations. Our derby is a day-long event and has about 10 stations. The event finishes with a formal banquet and the awarding of trophies. Klondike Derbies provide an opportunity for Scouts to apply their Scouting skills in a fun competition. In the weeks leading up to the Derby, Patrols that will be participating are given a required equipment list, and build (or use a previously built sled), similar to those dragged around the Arctic by dog teams. The sled will be pulled by the members of the Patrol during their competition. The photo below is of a loaded sled for a Klondike Derby. 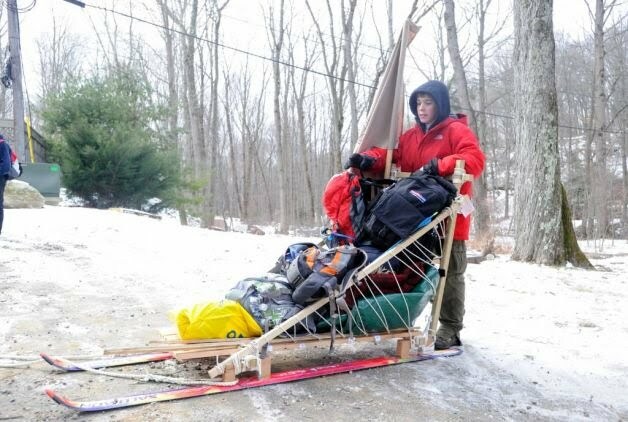 Note the use of cross country skies as runners, The patrol has to fit all of their personal gear as well as a list of equipment required for the derby into the sled. The patrol need to secure all items into the sled in such a way that if the sled is turned upside down nothing will fall out. (There is a test for this and points awarded). On the day of the event, all the teams gather at the Derby site, each team is given a number and a schedule and the Patrols proceed from one activity station to another, following the list provided by the organizing committee. The picture below is an activity station at one of Carleton area's Derbys. Activity stations can challenge the Patrols in many ways. For instance they may include winter backwoods first aid, cold weather survival, fire-building, and a wide range of problem-solving situations. Each Patrol will have to cook their lunch out on the course. Each Patrol member is required to bring along a lunch and something to cook it on. Traditionally, the last event of the Klondike Derby Weekend is the Sled Race, where all the sleds are lined up, the Patrols take their marks, and are given a go. They then race around a course, with the first sled across the finish line being the race winner. Competition scoring and prizes are a part of the derby and the scoring information is available on the site.